Contains my essay "Go to College After High School"
If you’re a girl, you should strive to look like the model on the cover of a magazine. If you’re a boy, you should play sports and be good at them. If you’re smart, you should immediately go to college after high school, and get a job that makes you rich. Above all, be normal. Right? Wrong, say 35 leading middle grade and young adult authors. Growing up is challenging enough; it doesn’t have to be complicated by convoluted, outdated, or even cruel rules, both spoken and unspoken. Parents, peers, teachers, the media, and the rest of society sometimes have impossible expectations of teenagers. These restrictions can limit creativity, break spirits, and demand that teens sacrifice personality for popularity. 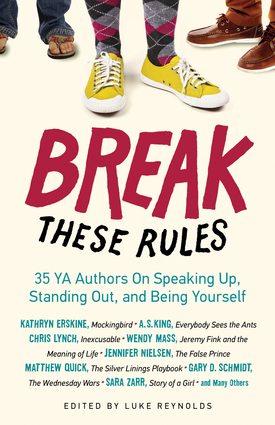 In these personal, funny, moving, and poignant essays, Kathryn Erskine (Mockingbird), Matthew Quick (The Silver Linings Playbook), Gary D. Schmidt (The Wednesday Wars), Sara Zarr (Story of a Girl), and many others share anecdotes and lessons learned from their own lives in order to show you that some rules just beg to be broken. 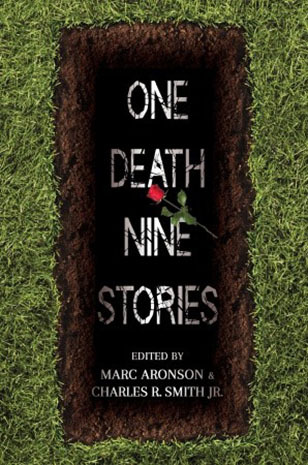 Contains my short story "Two-a-Days"
Edited by Marc Aronson and Charles R. Smith Jr.
Nicholas, Kevin. Age 19. Died at York Hospital, July 19, 2012. Kev's the first kid their age to die. And now, even though he's dead, he's not really gone. Even now his choices are touching the people he left behind. Ellen Hopkins reveals what two altar boys (and one altar girl) might get up to at the cemetery. Rita Williams-Garcia follows one aimless teen as he finds a new life in his new job — at the mortuary. Will Weaver turns a lens on Kevin's sister as she collects his surprising effects — and makes good use of them. Here, in nine stories, we meet people who didn't know Kevin, friends from his childhood, his ex-girlfriend, his best friend, all dealing with the fallout of his death. Being a teenager is a time for all kinds of firsts — first jobs, first loves, first good-byes, firsts that break your heart and awaken your soul. It's an initiation of sorts, and it can be brutal. But on the other side of it is the rest of your life. How could one teenage boy's life elicit other kids' first experiences — even after he dies? Nine interconnected stories from nine top YA writers.